The night camouflage parkas were originally designed to evade detection from night vision devices. Made from 50% cotton, 50% nylon material. Parka has button front, drawstring hood, button-closed pocket openings for easy access to clothing underneath. Chest (armpit to armpit): 27. Sleeve (armpit to cuff): 26. Length (top of the collar to hem): 33. ANY IMPERFECTIONS WE WILL NOTE IN OUR PICTURES. Actual colors may vary. This is due to the fact that every computer monitor has a different capability to display colors and that everyone sees these colors differently. Gently Used Condition– Still fairly new with minimal wear. Lots of life left. Shoulder to sleeve hem: 30". VTG US Army Military M65 Extreme Cold Weather Fishtail Parka Jacket Auth. Condition is Pre-owned. Jacket has a few repairs and inside tags are missing. Measures 25.5in pit to pit 37in top to bottom. Shipped with USPS Priority Mail. Shoulder (shoulder to shoulder): 20. Sleeve (shoulder to cuff): 26. Chest (armpit to armpit): 23.5. ANY IMPERFECTIONS WE WILL NOTE IN OUR PICTURES. Actual colors may vary. This is due to the fact that every computer monitor has a different capability to display colors and that everyone sees these colors differently. New 1984 non-issue. The G.I. night camouflage parka and pants were originally designed to evade detection from night vision devices. Made from 50% Cotton/50% Nylon material. 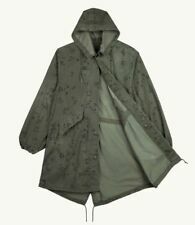 Parka has button front, drawstring hood, button-closed pocket openings for easy access to clothing underneath and interior buttons for the included NL002 quilted liner. Shoulder (shoulder to shoulder). Chest (armpit to armpit). Sleeve (shoulder to cuff). Length (top of the collar to hem). ANY IMPERFECTIONS WE WILL NOTE IN OUR PICTURES. Actual colors may vary. This is due to the fact that every computer monitor has a different capability to display colors and that everyone sees these colors differently. Length (top of the collar to hem). ANY IMPERFECTIONS WE WILL NOTE IN OUR PICTURES. Actual colors may vary. This is due to the fact that every computer monitor has a different capability to display colors and that everyone sees these colors differently. Shoulder (shoulder to shoulder). Chest (armpit to armpit). Sleeve (shoulder to cuff). ANY IMPERFECTIONS WE WILL NOTE IN OUR PICTURES. Actual colors may vary. This is due to the fact that every computer monitor has a different capability to display colors and that everyone sees these colors differently. Shoulder (shoulder to shoulder). Chest (armpit to armpit). Sleeve (shoulder to cuff). ANY IMPERFECTIONS WE WILL NOTE IN OUR PICTURES. Length (top of the collar to hem). Actual colors may vary. This is due to the fact that every computer monitor has a different capability to display colors and that everyone sees these colors differently.